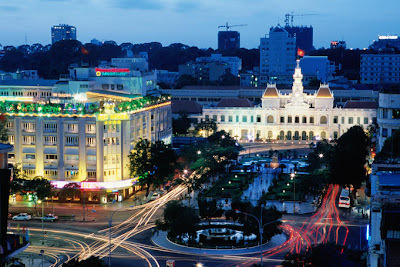 I've never been to Ho Chi Minh City but Ralph said it is a great place to visit! However, he also has mixed feelings about his experience in this city. He once left his briefcase containing his laptop in the back seat of a cab when he first arrived in Ho Chi Minh City in the middle of the night, several years ago. It was late and he was tired, so when the cab pulled up to the hotel, he paid in cash and didn't wait for a receipt. By the time he realized what had happened, the cab and his laptop were long gone. Apparently, the cab was privately owned so he had no way to track it since he didn't know the cab number. In horror, he was hoping for a good. Unfortunately, miracles didn't happen. Anyway, to cut a long story short, the bad travel experience has ruined his business trip. But, it was also his mistake for not to ignore the guy who was trying to get him an illegal cab outside of the Tan Son Nhat International Airport! I know arriving at airports is somewhat tiring after going through the hassle of endless tight securities and waiting for your baggage. The last thing you would want to worry about is how you would have to get to your next destination and how much it would costs you if you take those fancy airport cabs. Therefore, always book your hotel and airport transfer in advance, even if only for one night. They will make sure that your transfer is done smoothly and without hassle. Pre-booking your airport cab has got even more advantages as your transfer has already been paid for, so there is no need to worry about what is on the meter. 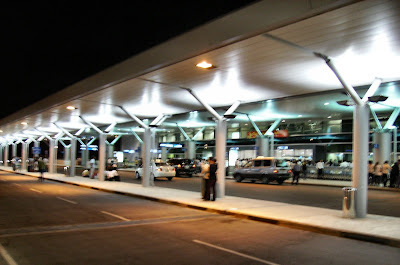 What's more, you will not waste your time waiting in long queues for a cab in the always busy International airports! So, have you ever left something behind in a cab? Was it ever recovered? Nope.. have never left anything in a cab.. though my stewardess cousin had.. she forgot her luggage...!! oh yeah I remember u told me before abt yr company trip and u shot a AK47! 8-) 8-) hmm why didn't really like it? i once left my cellphone and my wallet in a taxi .... yike,,, that is probably the worst experience i ever had..
that is why, when travelling it is better to have a friend at that particular country..
he has a new one now? gosh, that's like losing your life! must remember every belonging in a place where we don't belong. But sometimes we're just tired and there goes everything. :-$ :-$ :-$ :-$ inserting email..
what? 45 minutes! =-O =-O wow its hard to get a cab in Manila huh :-E :-E hmm yr family don't own a car Ane? why :'( :'( :'( Elai? Hey! Coincidentally, I'm like heading there next week! Poor him.. He must be totally s Iad losing it. I will definitely cry if I were to lose mine. Heart pain! So anyway, since I've never been there and he has, care to share some tips or recommendations or warnings whatsoever? ;P I sure hope my maiden trip there goes well.. I'm a bit skeptical about the place actually..
Never been to Ho Chi Minh. It looks beautiful from the picture. I was in Vientienne, Laos and finally got ourselves ( with three others) a boat (renting from nearby river people). It was fun cruising on the Mekong River (err like 20minutes). Sort of "pakcik, kamu sewa bot pak cik boleh bawak kami jalan ke sungai tak?" cruiser. Own the sampan ?? =-O =-O =-O =-O scary.. Yes Mon, arriving at an airport of a new country is somwwhat tiring, especially if you dont book your connection to your hotel. oh the traffic is really bad in HCMC...there are zillions of motorbikes on the road..so, watch out! The place was dirty Mon.. I see pple peeing on the roadside everywhere. Plus like you say.. there were so many motorbike.. each time I cross the road.. I had to scream and hold on my colleagues hand.. lol..